கல்வி சிறகுகள் ஆர்கே: Dictionary PCB contains lots of definitions from Physics, Chemistry and Biology. Dictionary PCB contains lots of definitions from Physics, Chemistry and Biology. 2. Chemistry Dictionary : This Application contains over 9000 "Chemical Terms" along with their Definitions. It is very helpful to the chemistry student and also helpful for IIT Exam and PMT Students. The app allow you to search chemistry terms and see the definition for the same. A simple app designed as a quick reference for chemistry students. 3. Biology Dictionary : With more than 3500 biological terms and their meanings, this Biology Dictionary will sure cement your basics of Biology. For quick and smart learning this Biology App has lots of pictorial presentation of all terms and many more. Its very easy to use dictionary for all students. Physics Quiz section contain eleven quizzes with lots of questions from physics and science. Chemistry Quiz section contains all types of important questions like chemistry formulas and many others. Biology Quiz provides you to better understanding of Bio subjects. All Quiz has Multiple Choice Questions. Keep Practice for better results. 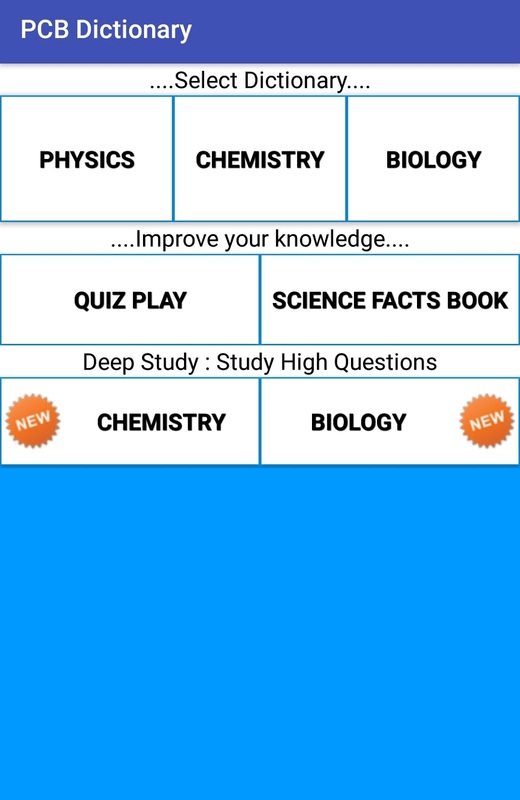 New feature of our app for science students : our app now contains Science facts Book which gives you very attractive facts that will blow your mind, and now we are working on new feature that is deep study of Physics, Chemistry and Biology, so enjoy reading and wait for next update soon. 1. Physics Dictionary offline is available to use it without internet. 2. Chemistry Dictionary offline is available. 3. Biology Dictionary offline is available with addition definitions of biology chapters.